If you hadn't figured out by all of my posts about kale, it's by far my favorite vegetable. In fact, it's my favorite food ever. I can't get enough of it. I must be vitamin K deficient or something. 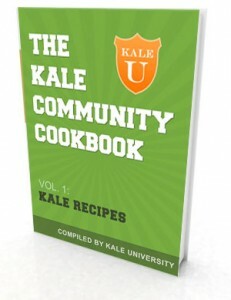 Well, if you like kale, you'll love The Kale Community Cookbook brought to you by Kale University. This is a free e-download filled with inventive ways to include kale in your diet.